What am I up to in January 2012? 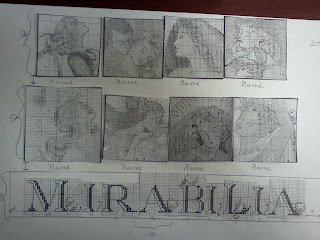 Well I continue to work away on Christmas Flourishes by Mirabilia. I started this piece in early November 2011 - and I have diligently worked away at it - probably 2 hours a day on average minimum for two months. I am proud of this piece - its the biggest I have undertaken and my fifth Mira. It is stitched on 28 Count Opalescent Lugana in Mystery Blue. What is next? Well I am happy to say I am joining my first RR (round robin) and its Mirabilia Themed. It has 8 participants and we are all very excited. 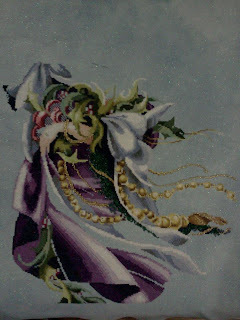 I am going to stitch mine on 28 count Bo Peep Lugana - here is a photo of my "concept" - which is themed "Moments that make you take a deep breath".... The patterns chosen from top left to right are "Stargazer", "The Kiss", "Christmas Elegance", "Mothers Arms" bottom left to right "Circle of Friends", "Lilly of the Woods", "Madonna of the Garden" and "Rose Celebration". The font used is from "Nouveau Sampler"
I can't wait to start my next project which will be Mirabilia's Golden Girl Apples. Great stash give away at a fellow stitchers blog! I was reffered to a cool blog from a friend - where there happens to be a great give away.... take a look! Joining the bandwagon - or just becoming one with the times? I have several friends thave now have blogs - and I enjoy them tremendously - so it makes sense that after prompting from some I decided to start my own - right now I will likely keep this blog as general musings about my life as a cross stitcher - but over time - who knows. For now I will let it grow freely with me! Living life in Atlantic Canada. Loving quiet time with my family. I cross stitch, I do yoga and I love cats! Top 10 most recently updated blogs I follow!